Hopefully you have started your emergency binder and are finding the free downloads and tips from Emergency Preparedness: The Emergency Binder helpful. But something just as simple to come up with and equally important is to develop an evacuation plan. The good thing about this is that nothing has to be purchased…you just have to find the time, rather make the time, to sit down and develop one. Ultimately your evacuation plan will go into your emergency binder with your “What to Grab List” on the front of the binder. When establishing an evacuation plan it is important to remember that when you are in an emergency is NOT the time to be planning and that this is something that you will need to remind you and your family of protocols, especially if you have young children…or a memory challenged husband like my own. Based on the research I have done, I would recommend doing the following steps when you sit down to develop your evacuation plan. This is what our family will be doing this week. 1. Schedule a time to meet with your family (include extended family if they are coming to your home in emergencies). In our case, for certain emergencies, it has been established that my single over 50 mother will either make her way to our house or we will come get her. Therefore, she needs to be a part of our emergency planning. 2. Determine what type of natural disasters and other emergencies that are most likely to happen in your area. On the east coast of North America, it is not likely to have earthquakes but tornados, severe weather, hurricanes are a much more common threat. On the flip side, earthquakes and even tidal waves are more prevalent in the Pacific Island area such as Hawaii but they probably don’t need to plan for severe snow storms…unless mother nature decided to have a meltdown of some sort. 3. Discuss these types of emergencies and determine/discuss how to respond to each and whether it is better to stay or leave in each. 4. If you determine there are some emergencies where it is best to stay at home, determine safe locations for you family. For example, in severe thunder and lightening storms in my home state it was not uncommon to have winds or tornados that could blow out windows. During these type of emergencies, it was best to find a place to stay within the home where there were no windows or glass exposure. 5. Discuss power outages and injuries. For example, when the power goes out, it is sometimes not uncommon to loose water as many areas still rely on pumps. It may be a good idea at that point to fill bath tubs with water so toilets can be flushed. And if your house is anything like mine, the fridge is open constantly. During a power outage it would be important for children to know this is not good or food could go bad faster. 6. Establish a list of contacts and teach children the most important ones to know and when to call. These would include 911 and your cellphones and that of immediate family. If someone is coming to your location in an emergency or you are meeting people at a secondary location, make sure those are included as well. If you still have and use a house phone, post these by each phone. If not, make sure they are stored in everyone’s cellphone. Here is an example of escape routes using our house. As you can see, each room should have at least two escape routes. 7. 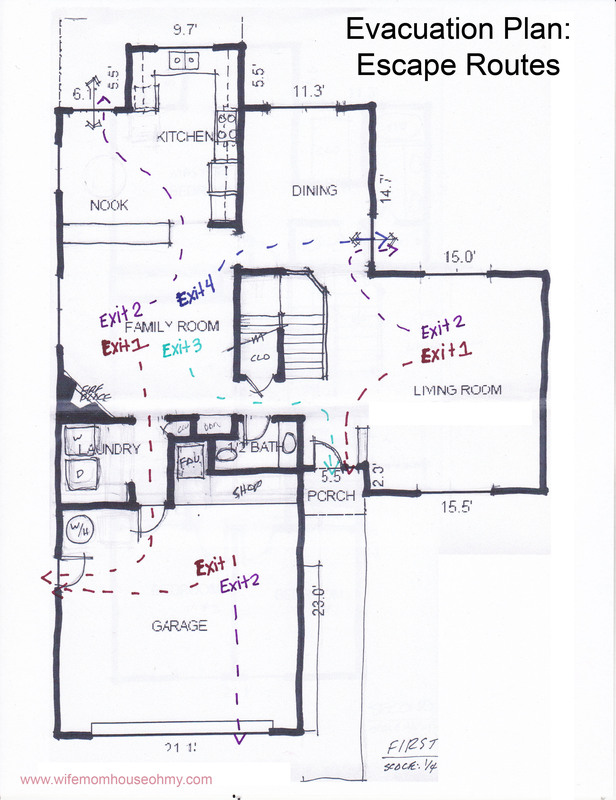 Draw a floor plan of your home. Mark two escape routes per room and make sure each person is aware of each. If you live in a two story home, a good investment for your family may be escape ladders that can be unrolled in emergencies to escape through second story windows. These are good especially in fires or if in an earthquake stairs are blocked. 8. Pick two locations outside of your home – one local to your neighborhood and one outside your neighborhood – to meet if you can not get back to your home or if you are evacuating separately. Establish the priority for each with respect to if/than scenarios. For example, in our recent fires here in So Cal, it would be smart to establish, the first location to meet is the house, if that is not possible, the second would be our local community church and third would be my mother’s home about 10 minutes away. 9. Develop an evacuation list of things to grab if you are asked to evacuate your home. To start creating this list, you can reference my post on what to grab. However, you will need to make two lists – one for a moment’s notice and another for 30 minutes to an hour. These lists need to be in priority with the most important things to grab at the top. If you have young children, this may only include you and your spouse. If you have teenagers, give them their separate list as well to maximize what you can grab. I suggest putting locations next to what you have listed to grab. Often we panic in emergency situations so the less you have to think, the better. Make sure you list your 72-hour food and survival kit on the list. 10. Consider having everyone over the age of 15 taking a CPR and first aid class. There is nothing better than being prepared and in this case, these lessons can help beyond just evacuation emergencies. An added bonus is this training can also help kids get part time jobs too! If you already have been trained and its been a while, consider a refresher as techniques do change. 11. Make sure to have review sessions frequently – perhaps every three months for the first year and then semi-annually afterwards. An emergency plan and evacuation plan only works when you remember the plan. Ultimately everything discussed needs to be written down and put in to your emergency binder. You can pull this out for review sessions. But with it securely in one location, there is never a question of what to do. I have included below FREE PDFs of the grab list and evacuation plan development sheet. Both are based on my research and this posts. Again these are for personal use only. I hope you will find them helpful. Do you have any other great ideas that you feel are important to consider when putting together and evacuation plan? If so let me know. I want to make sure I am covering it all. See you next post.